Capt. 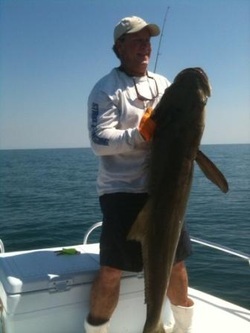 Tyler has fished the local waters for over thirty years since moving to Brevard to attend and graduate from Melbourne's Florida Institute of Technology in 1979. After thirty years in the corporate world Capt. Tyler has turned to his true passion of fishing and sharing that fishing experience with others. So, come on and join him for a day on the water. You can't catch em' sitting on the couch! Sebastian Inlet is located on the east central coast of Florida. On the Brevard and Indian River county line, Sebastian Inlet is near the cities of Melbourne and Vero Beach, Florida. It is also about one and a half hours from Orlando. So this is a great place to come if you are scheduling a family vacation to visit Florida's world famous theme parks such as Disney, Universal Studios, Sea World and Kennedy Space Center. You will welcome our laid back serene beach area after a few days of theme park mania. Come visit our beautiful beaches where oceanfront accommodations are very reasonable. We can help you find the right accommodation for your group. Kick back, enjoy the beaches and do a little fishing. Families and youngsters are welcome and a specialty. I really enjoy watching kids having a great fishing experience.